Rachelle is passionate about using her expertise in law to help others. Having been called to the bar aged just 22, she obtained a pupillage at the Crown Prosecution Service and was subsequently taken on as a Crown Prosecutor. She has volunteered at Birmingham TUC Centre for the Unemployed, founded a youth club in her local area, and mentors individuals going to university who hope to work in the legal sector. She has also been active internationally, pursuing her interest in human rights by contributing to an Amicus Brief on abolishing whole life sentences without parole for youths in the USA, which was backed by the country’s Supreme Court. She was a Visiting Professional at the International Criminal Court in The Hague, where she worked on the case of former Democratic Republic of the Congo Vice-President Jean Pierre Bemba, who was on trial for war crimes and crimes against humanity. After that, Rachelle spent time in New York, working at a top criminal law firm undertaking work related to terrorism cases and issues covered by institutions such as The Center for Constitutional Rights and the American Civil Liberties Union, in fields including racial justice, police accountability, Guantanamo Bay and other contemporary issues. Most recently, Rachelle secured herself a position in Chambers as a barrister undertaking Criminal Defence and family work. She has received two Criminal Bar Association Awards, four Honourable Society of Lincoln’s Inn Awards, one Bar Council Award and many other prizes acknowledging her excellence in law both nationally and internationally, and her work in the community. She has been invited back to Birmingham City University on numerous occasions to deliver talks on how to become a barrister and give career advice. “At the time, this was the only university that allowed us to do a placement in the second year, which was very attractive to me as it allowed us to combine studying with gaining practical experience. The teaching there was great; I had Graham Wright in the first year who was amazing and Ewan Kirk for EU law, who I still speak with to this day. I went to New York on placement, where I worked for a criminal law firm and defended clients in a number of cases, including one of the defendants from the 2005 London bombings and murder trials. It was an amazing experience and it allowed me to see how what we learned in class was used in a workplace situation. “The two main advantages I gained, which helped me later in my career, were the international placements I engaged in, which they were very interested in when I applied for a pupillage, and my mooting experience, where we took part in debates in the University’s mock courtroom and entered competitions to enhance our skills. I remember when we had the ‘balloon debate’ in the first year – being me, I put myself forward to speak and I was absolutely petrified, but as I did more and more, it really cemented my love of advocacy and helped to build my confidence. “After finishing my degree, I undertook my Bar Professional Training Course then returned to Birmingham City University to complete a Master’s because I’d found that, as I was studying and getting involved in different areas of law, I had a particular passion for human rights, and I wanted to enhance my knowledge in that area. I loved my experience at BCU, and I knew I would be learning from a lot of the same lecturers again, so even though I actually got a scholarship to study somewhere else, I knew that BCU was such a good university that I didn’t mind paying to go there. I got to undertake another placement in New York, this time at the offices of criminal defence attorney James Kousouros. I was given a lot more responsibility and this time I was able to get involved in some human rights and social justice-related cases. “After my Master’s, I started applying for pupillages and received one with the Crown Prosecution Service. After working as a barrister for 2 years, I then got a placement at The Hague in the International Criminal Court as a Visiting Professional. I also won a few awards which helped me to gain further experience – I returned to New York after being chosen by the four Inns of Court to receive the Pegasus Award, I also won the Criminal Bar Association Award and the Bar Council Award. 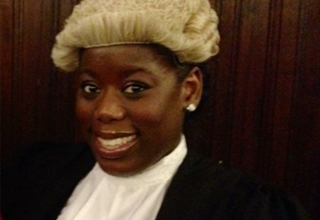 I recently returned to the UK where I now have a new role working as a Barrister in chambers. “Outside of work, I started a youth club in my local area to get young people off the streets, give them somewhere they can come in and talk about anything they want and get a bit of help if they need it. I also mentor students who are studying law, undertaking their Bar Professional Training Course or going into a pupillage, and I’ve set up a network for new barristers and practitioners, so they can ask any questions they might have and support each other if they’re worried or nervous about anything. On top of this, I undertake international work that helps groups like Amnesty International and The Center for Constitutional Rights in the USA, on topics of police accountability and the recent attempt by the Trump administration to implement a travel ban on certain Muslim countries, so it’s a busy time for people in my field at the moment. “I have the motto that ‘anything I can dream I can achieve’, and I definitely want to help as many people as possible in my career and leave the world in a better place than I found it. I’d love to start my own NGO [non-governmental organisation], working in the field of international human rights and do as much as possible to promote social justice. I’m still trying to find a balance between all the different things I do and am even contemplating completing a PhD in law – I’m one of those people who just wants to do everything so I take on as much as I can, and sleep is having to take a bit of a back seat for now! “Everything I studied relates to what I’m doing now. I feel so blessed to have got a pupillage which is so hard in the current economic climate – there are perhaps 40 or so on offer each year and tens of thousands of applicants. There’s no way I would have been offered the chance to work at the ICC without the work I’d done on my LLM, I wouldn’t be a barrister without everything I’d learned on my LLB, and I wouldn’t have got my pupillage without my experience on placement.